Back in late February, I made a decision to join the Water Rocks! team for the summer. Little did I know that decision would take me to every corner of the state, meeting countless new faces. I knew this summer was going to be an adventure but I had never guessed that it would be on such a great magnitude. My name’s Wyatt Kaldenberg, a pretty standard farm boy from Southern Iowa. I grew up being surrounded by agriculture, on the family farm and got very familiar with the ins and outs of farm life. I soon realized it was difficult to get people not involved in agriculture to become interested in it. 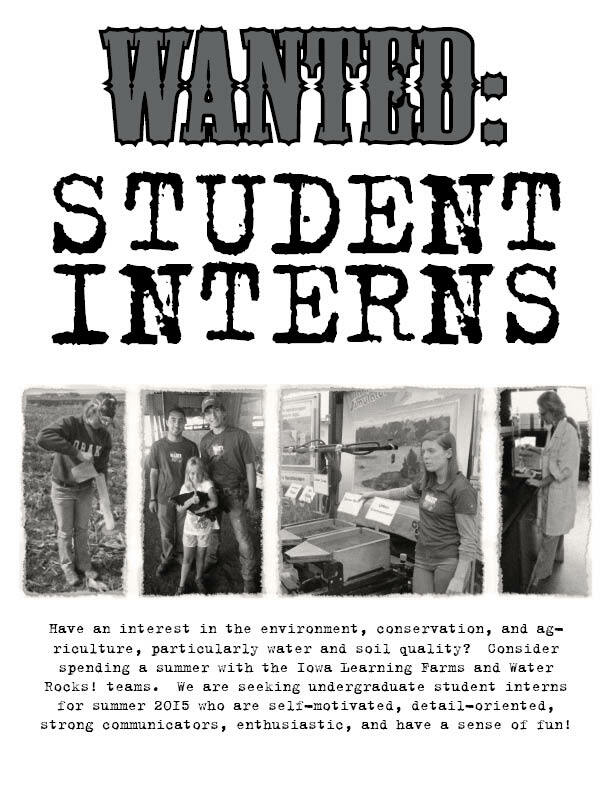 I think that’s what has surprised me most about this internship, people’s willingness to explore agriculture. Last week I was at an event in Eastern Iowa, with the Conservation Station. The Conservation Station is a trailer that features a Rainfall Simulator out the back, as well as an Enviroscape watershed model. At this event I was stationed at the Rainfall Simulator and answering questions from the occasional passerby. A family of five stopped by the simulator. The dad told me that he had grown up on a farm but he had chosen not to farm as a career. Being in the same boat myself, we soon struck up a great conversation. We talked about the importance of soil conservation and improving water quality. His three kids soon became interested in the rainfall simulator and started asking some questions themselves. “Why does that look like chocolate milk?,” one kid asked while pointing to the runoff from the intense tillage tray. I explained that working the soil could make it loose and how it could easily get washed away from the field if there was a big rainstorm. The answer satisfied her question and I told her that her and her siblings could learn more if they went to the side of the trailer and checked out the Enviroscape, or as we call it, the Watershed Game. The dad then said to me, “I want my kids to know about this stuff; a lot of people don’t realize how important it is.” I agreed and we talked for another minute or so before he thanked me for my time talking and joined his kids and wife at the Enviroscape. Wyatt had the opportunity to present the Rainfall Simulator to both Lieutenant Governor Adam Gregg (L) and Secretary of Agriculture Mike Naig (R) at county fairs this summer! Although I just described one conversation I’ve had while on this internship, this is not an unusual encounter. People from all over Iowa, agriculture background or not, want to learn more about how they can help maintain Iowa’s beauty. It’s nice to be able to tell them that no matter if they’ve lived on a farm their whole life or just seen cows from the interstate, they can help make a difference. I’m so ecstatic that I’m a part of a team that gets to spread that message. The future looks bright, Iowa. Wyatt Kaldenberg, originally from Indianola, is participating in the 2018 Water Resources Internship Program. Kaldenberg grew up on a family farm and has served as an Assistant Commissioner with the Warren Co. Soil and Water Conservation District. In the fall, he will be starting his junior year at Iowa State University, majoring in Finance and Management with a minor in Ag Business. Today’s guest blogger is Iowa Learning Farms/Water Rocks! student intern Mikayla Edwards. Originally hailing from the Anamosa area, Mikayla is beginning her senior year at Iowa State University, pursuing a degree in Animal Ecology. Three hours away, there is a faraway land that we like to call the Southeast Research Farm at Crawfordsville. In that faraway land our Iowa Learning Farms program has placed fancy tubes two feet into the ground. These tubes are called lysimeters. Lysimeters have a vacuum seal and collect the infiltrated water from the surrounding ground. 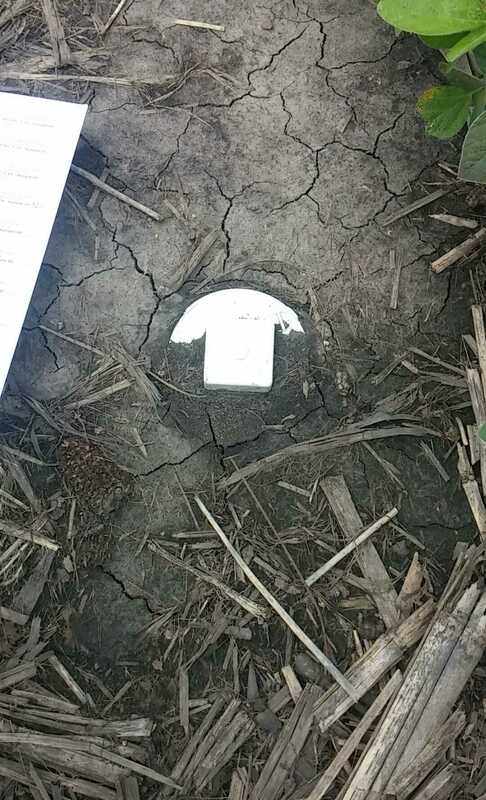 As part of our National Conservation Innovation Grant cover crop mixtures project, our program is using these lysimeters to test the water’s nitrate levels in corn/soybean fields with different forms of cover: single species cover crop, cover crop mixture, and no cover. 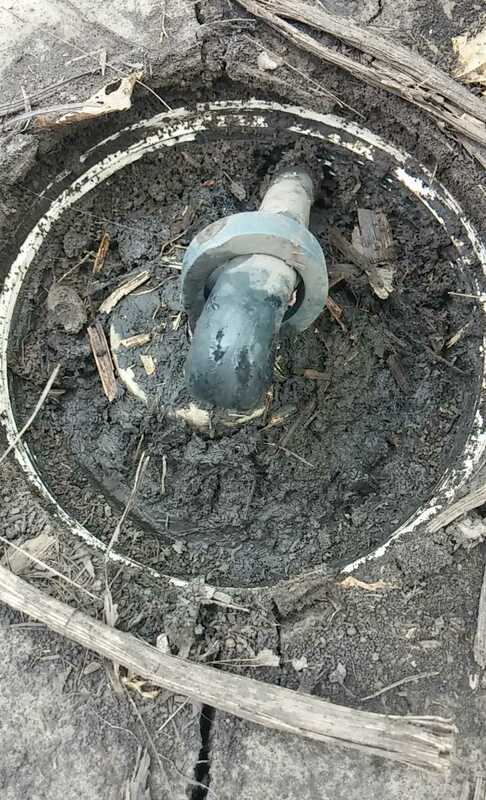 Water is collected biweekly from the Southeast Research Farm and four others around the state to see how the different levels of cover are affecting the nitrate levels in the water. Visually, the sites all look pretty similar other than the different covers. A couple areas in each plot still have cover crop remnants but the only thing in the other areas is this year’s crop, either corn or soybeans. 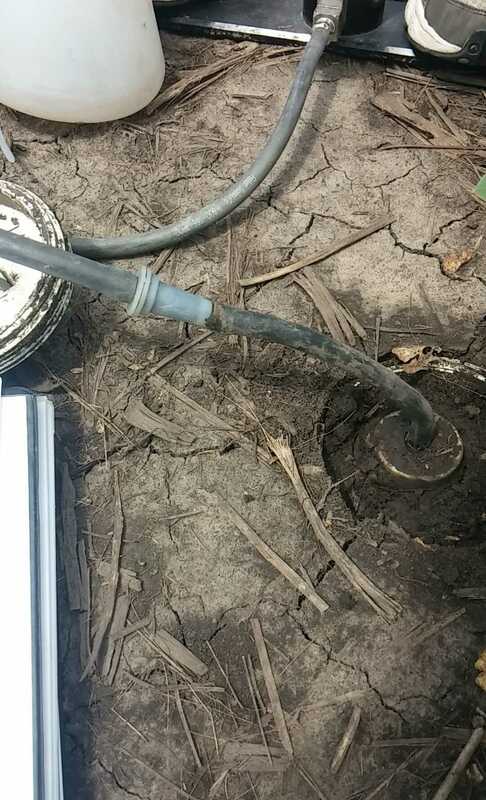 This is what a lysimeter looks like from the surface – notice the white PVC cap protecting the lysimeter inside. Sometimes they are covered completely or just partially depending on what has happened in the field lately. 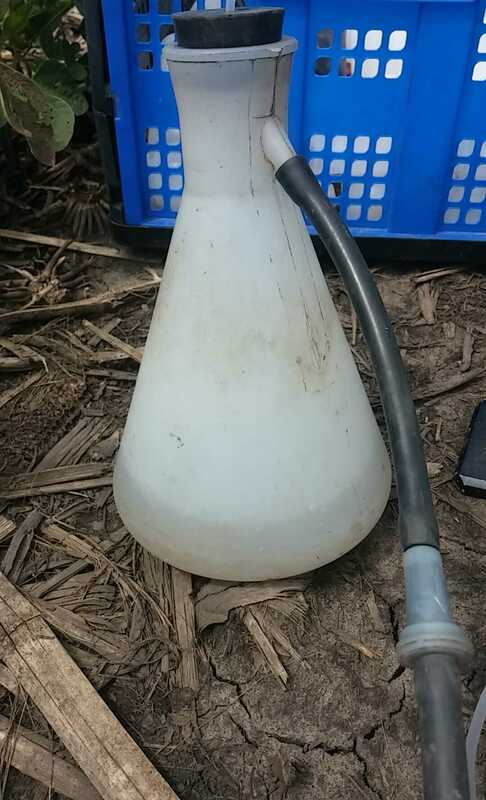 This is what the lysimeter looks like once the protective cap has been removed. The O ring holding the bend is removed and then a small tube from the collection flask is threaded through the top of the rubber opening at the top of the tube. Collecting the water samples is not a difficult task. All that has to be done is open a small tube that has been bent to hold the vacuum seal, attach a vacuum pump to a collection container, feed an even smaller tube from the collection container into the lysimeter, give the vacuum a few pumps and wah-lah! Assuming there is a sample, water will quickly start flowing into the collection container. Once the tube is all the way to the bottom of the lysimeter and a vacuum is applied, a sample fills the collection flask! After the sample is collected, there are a few other steps to be completed. 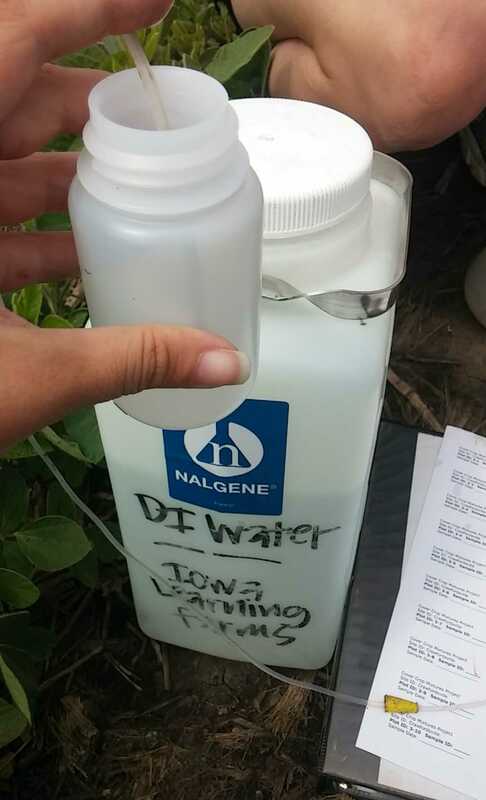 First, the sample must be emptied into a clean plastic bottle and labeled with the lysimeter number, location, date, and level of cover. Any leftover sample water is dumped a few feet away from the lysimeter to prevent it from going right back in. Next, deionized water is used to clean the collection container and tube. This is done by putting the tube into a bottle of the deionized water and giving the vacuum a few pumps so the water flows through the tube and is then swished around the collection container and also dumped a few feet away. Once the sample is emptied into a bottle and labeled, the collection flask and tubing must be cleaned with deionized water, aka DI water, to prevent any cross contamination from one sample to the next. Lastly, the vacuum seal must be reapplied so that a new sample can be obtained over the next couple weeks. For this, the vacuum pump is attached directly to the lysimeter and 60 psi of pressure are applied. An O ring is then placed over a bend in the tubing so that the vacuum stays sealed in. After everything is cleaned, the vacuum is reapplied to the lysimeter so that a sample will be collected over the next two weeks for testing! So, that is the process for one lysimeter and there are 24 at each research farm. The whole process takes about two hours depending on how many samples there are, which is affected by the amount of rainfall there has been. Lately, we have had a lot of rain so we have been getting 20-24 samples from each farm! For comparison, when we started back in May, we were only getting around 15 because of the dryness. So, that is how a lysimeter water sample is collected! But that’s not all we have to do! The three hour drive home must be repeated and then the data must be entered into the electronic database when we get back to campus. We record which lysimeters had samples and they are given a new sample ID number. Then the labels are taped on to prevent any damage and they are placed in a cooler until they can be sent to the lab for testing. The whole process is actually pretty fun when you work with fun people; good conversations are always had with fellow interns. The tan lines though, they are pretty atrocious!